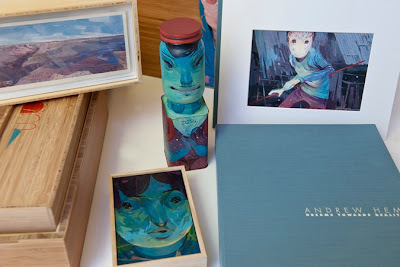 Now that Andrew Hem's Dreams Towards Reality clamshell edition with graphite drawings has officially debuted at Nucleus Gallery, I can give you more details on the deluxe box set edition that is being offered through Zero+ Publishing. 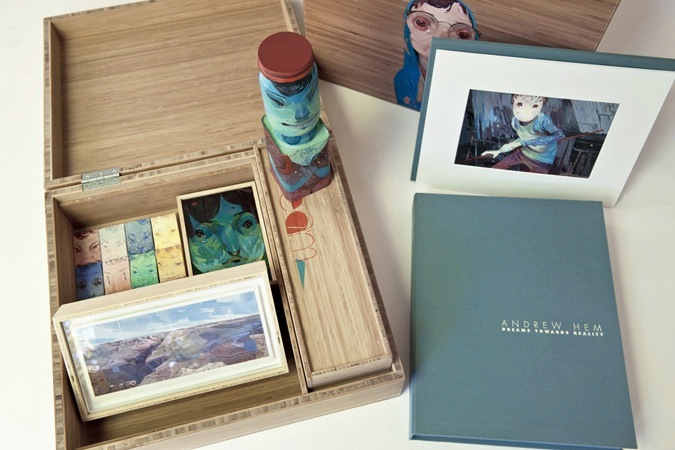 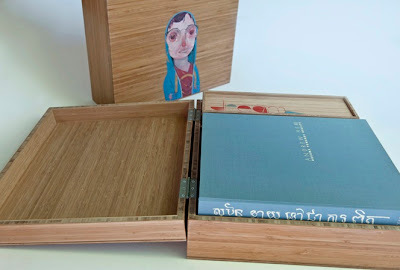 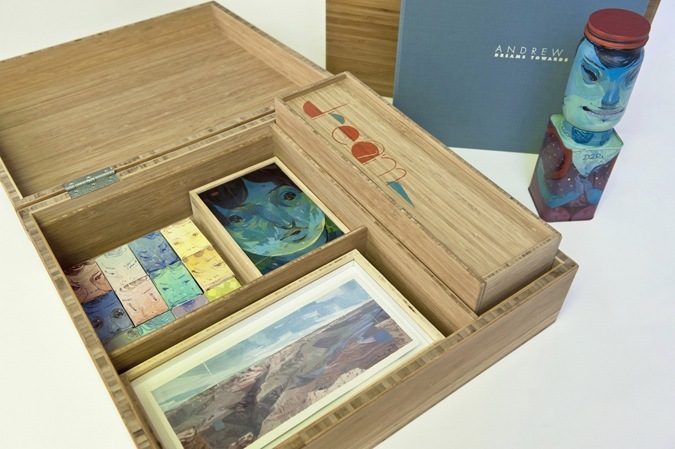 Created in an edition of just nine, each handcrafted bamboo box features an different character painted on the lid, and contains five additional works of art, plus a signed and numbered book encased in a clamshell. 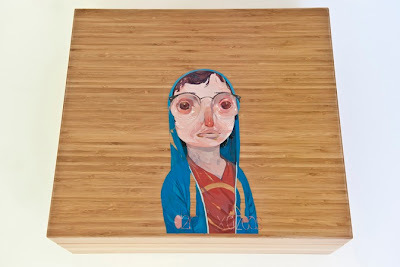 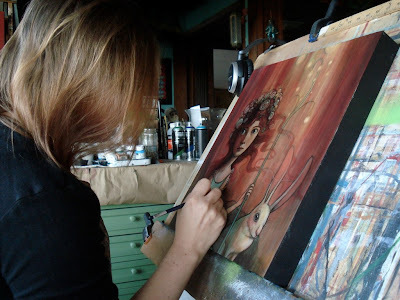 When you crack open the box, you will find an original 5x7 matted painting enclosed in a cloth portfolio, an assemblage of 12 matchboxes, a landscape painting, a small character portrait, and a jar sculpture inside a smaller bamboo box embellished with Andrew's handpainted text designs. 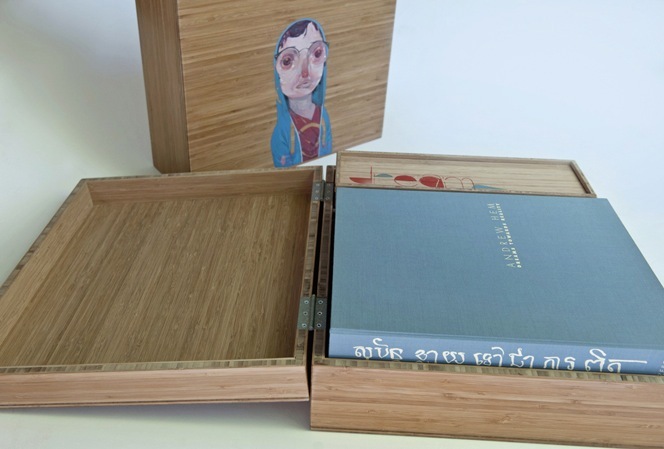 Only the first edition (pictured) has been completed right now, but the entire edition will be ready for shipment by early January. The collection of six original artworks is currently priced at $2500, but Zero+ scales its prices higher as the edition sells out, so if you're interested, don't procrastinate... the edition is already more than half sold, sight unseen.